A couple of weeks ago I re-posted a picture Micah had put on Facebook. It’s in this blog post. 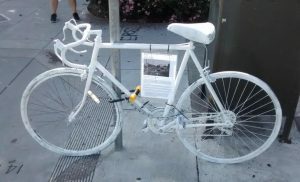 Then last week I saw an article in the SF Examiner about ‘ghost bike’ memorials. You can read it here. What caught my eye more than the headline was the picture. Now I understand the lineage of what Micah (or Jake) was doing. There are a lot of important issues facing Americans these days and maybe this isn’t the most important but it’s important to me. Almost every day I see drivers doing dangerous things. They run the gamut from changing lanes without using turn signals to running red lights. I mean really red. I often see drivers rushing to be first on merges, too. It all stems from people thinking they need to get somewhere now. Really, folks, what’s the rush? Three quarters of the time I see a guy (or woman) slide through the red right turn from Linda Mar to Highway 1 without stopping – or sometimes without even slowing down – I pull up along side then at the next light. Are you late to work? Late to getting the kids to school? Going to the grocery store? Hurrying home with your Chinese take out? Whatever it is, it it worth killing someone? Yeah, I know, you’re a careful driver. I’m sure Shawn R. Allen would have said he was a careful driver before November 14th last year. Maybe he still thinks he is.